This one gave me fits. I found out that working with an open grain like Oak, you have to be very careful when sanding to keep aluminum dust out of the grain or it will turn black. I had to turn this one down 2X from the original profile that I wanted. I had to very carefully selectively sand to keep the aluminum out of the grain. Maybe a sanding sealer or a thin application of CA first would help or just stick to darker wood when using aluminum? It has 4 coats of Hut Crystal Coat, I was afraid of using CA with all of the trouble I had. 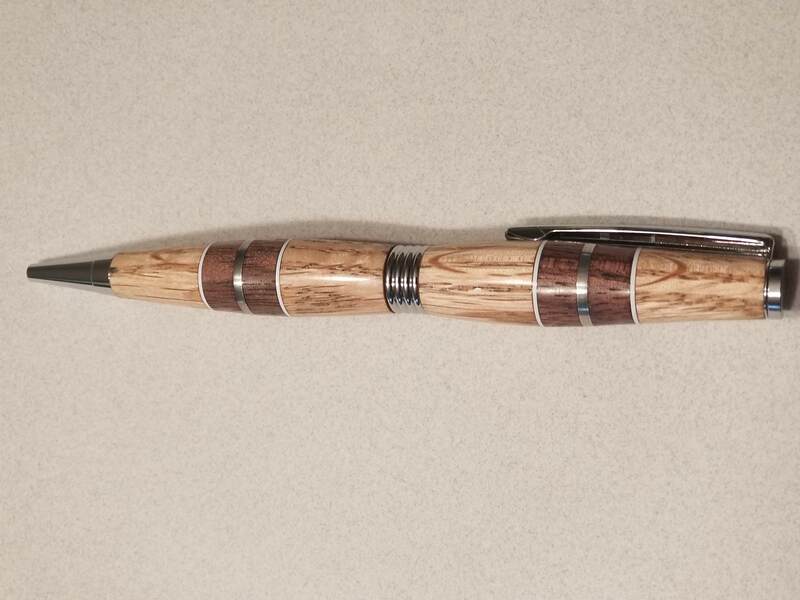 Great looking pen! It may have caused you a lot of work but the end result was definitely worth it. I have routinely used application of CA, thin and like a primer coat to help prevent color contamination by either metals or when segmenting different color woods. Sometimes I needed to reapply the CA as sanding progressed. The other approach is to practice and get proficient with the skew so that you go direct to finishing right off the tool (no sanding). I am not at that level, but maybe some day. As Steve said, try to get good with the skew. You will skip all sanding and go right to finishing. Even that you need to be careful not to rub that first coat much. Just use thin and briefly wipe across. A very sharp HSS scraper will do the same as the skew - you don't need to sand. Carbide scrapers might do - IF they are sharp enough. Since then - many done without SP. Sandpaper smears; wiping doesn't always get the smear/dust off. Not-with-standing your challenges, this is a fine pen. The above suggestions are all excellent. My only addition is that I use compressed air to blow out aluminum/wood dust from open-grained woods prior to finishing. Depending on the species, I also will blow out the material, then apply sanding sealer. Thank you all for the kind comments and great advice. I am using EWT carbide tools for cutting but was getting some tear out on the open grain of the oak. I have a cut down paint brush (to stiffen the bristles) to brush out the dust. I also did a wipe down with acetone to no avail. It seems like oak and aluminum are fickle materials on their own and putting them together presents another set of challenges. I may have to try the skew route. What would be a good size to start with? Would a wider blade be easier to work with keeping the toe away to avoid catches? By the way Hank, that piece is amazing! I have a 1” oval skew I like. Another choice is a skew with a radius shape grind and this really helps the toe out if the way. I wouldn’t go less than a 3/4”. On the aluminum/wood, I would try to sand from the wood towards the aluminum. Yes to a sealer/thin CA to help prevent the aluminum dust contamination. Nice job on the pen! When you start with the skew I can promise you will want to quick. Takes time, sometimes more time to become proficient than most are willing to spend. Once you are comfortable with the skew you will never be sorry for the time you spent learning to use it. "A very sharp HSS scraper" (Hank) is also good. With both tools the key word is SHARP. Last edited by Hubert H; 03-05-2019 at 08:31 AM.